Sold | MKE Drum Co.
Below you will find items that have sold that you just missed. Gone but not forgotten! For sale is a vintage 1920s Ludwig & Ludwig 17 inch diameter x 12 inch tall Military Model Separate Tension Street Marching Snare Drum. Everything appears to be original, and it includes a vintage hard case and vintage sticks. Sticks have “National 3A” debossed on them. 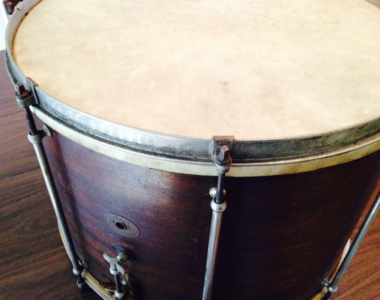 Drum is in great shape for as old as it is. 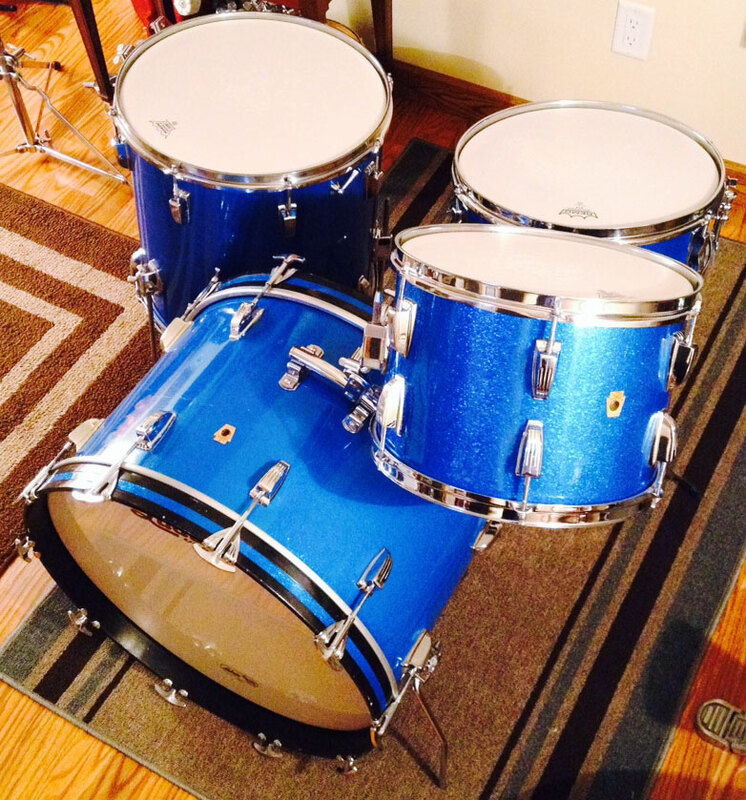 For sale is a vintage late 1960s Ludwig Classic in Blue Sparkle Set for sale. Sizes are 22/13/16 with matching 14 pioneer snare. 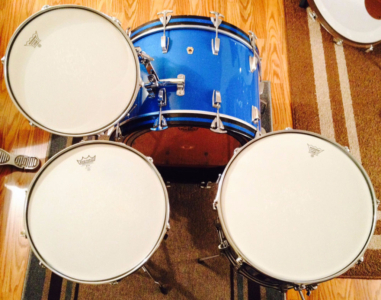 Badge numbers and dates are Bass Drum: #703214 1969, Snare: #629134 1968, Mounted Tom: #439399 1967, Floor Tom: #557207 1967. All badges and grommets are original and tight. All drums are in round and bearing edges original and intact. Very minimal pitting on chrome here and there, but overall very clean. 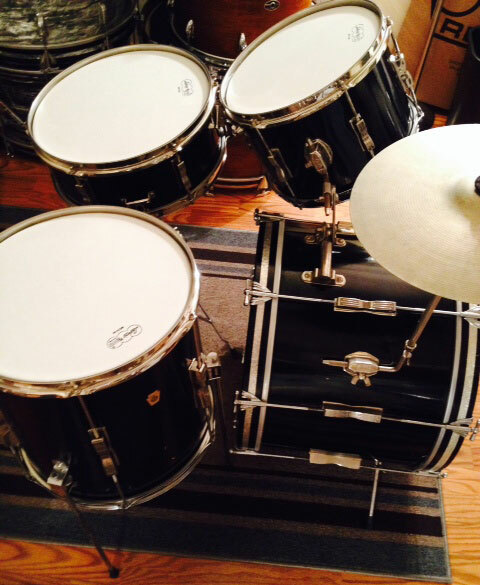 Wraps have minimal scuffs – I have shown the worst on the mounted tom in the photos – and the bass drum wrap is a little faded, but not bad. Both toms have the painted white interior and snare and bass have the clear maple interior. 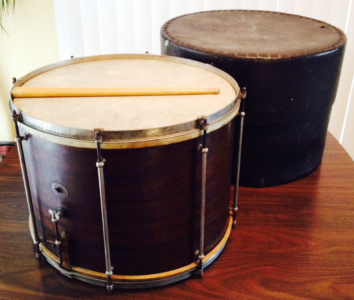 Bass and mounted tom have original dealer stamp inside. 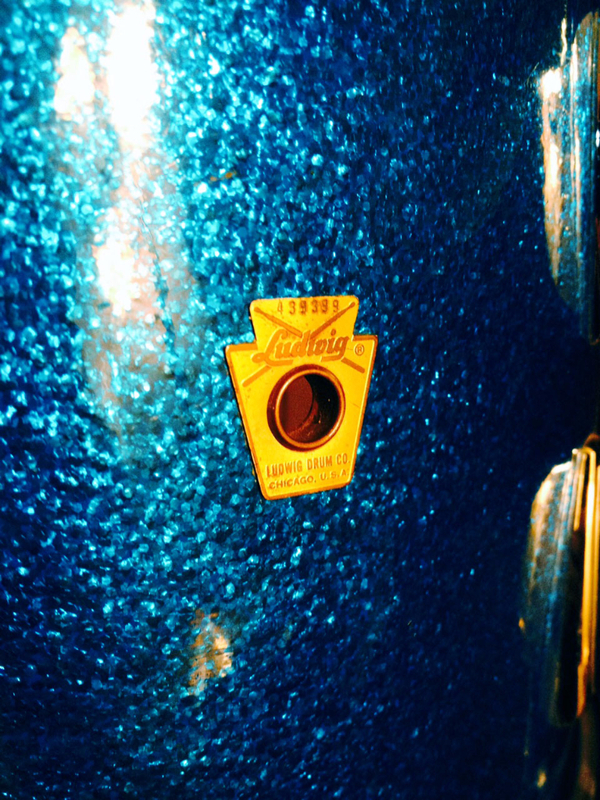 The bass has four extra rail holes that have been filled and capped with matching wrap so they are not that noticeable. Looks like the rail may have been set up for a lefty on the opposite side of the bass at one point. 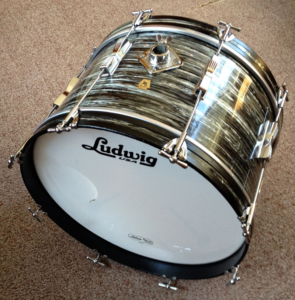 For sale is a vintage 1966 Ludwig Club Date Black Oyster Pearl Bass Drum Oddity that I picked up in a lot of other drum gear. What makes it an oddity is whomever restored it cut the back down as it used to be a 20×14 and now is a 20×12. 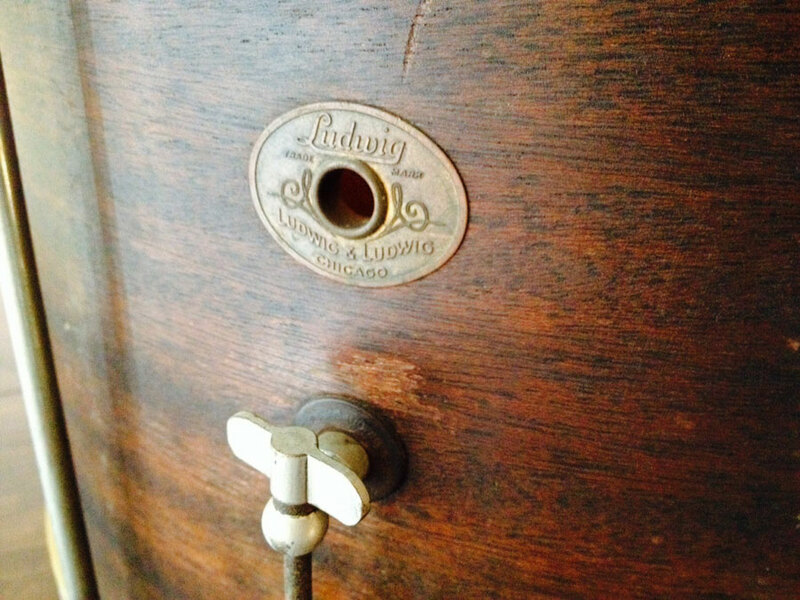 The process looks to have been done well as the rering was moved and intact. Looks to be repainted on the interior and on the hoops. Wrap seems original and tight. 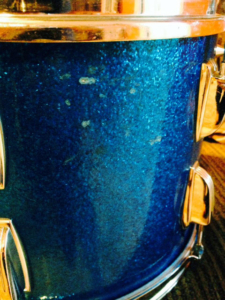 All chrome hardware is excellent. Tom mount seems to have been upgraded from a rail to post. 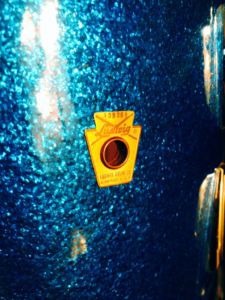 Holes from a cymbal arm mount and from rail mount are plugged with chrome caps. Keystone badge number 367580. 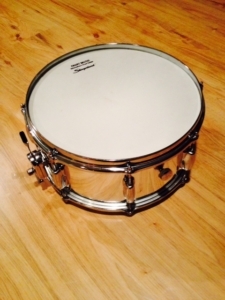 Overall a very clean drum. Sounds and plays fantastic! The 12 inch depth gives it a nice punch. For sale is a vintage 1965 / 1966 Ludwig Club Date Set in Black Lacquer with Matching Pioneer Snare. 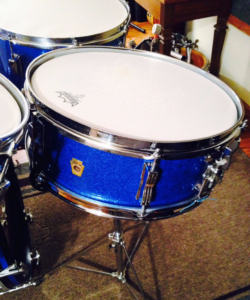 12/14/20 and 14 snare. 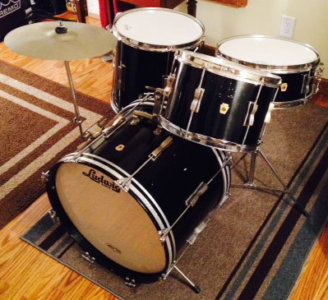 Hardware appears to be mostly nickel, except for the floor tom legs and mounts, bass drum Ts and claws and the bottom hoops on both toms. 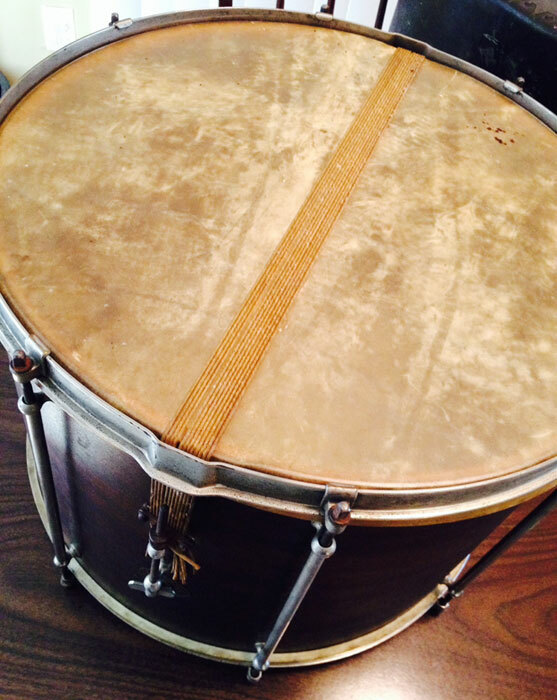 Other hoops are nickel over steel besides the bottom snare which is nickel over brass. Normal wear and chips for a club date of this vintage, but very clean overall. Bass drum hoop inlays have some usual seam issues. Shells are white interior and all in round with good bearing edges. Badges are very close in number and tight. Original bottom head on snare as well as original snare wires. Also includes the cymbal arm and a 13″ Ludwig Standard Paiste cymbal. 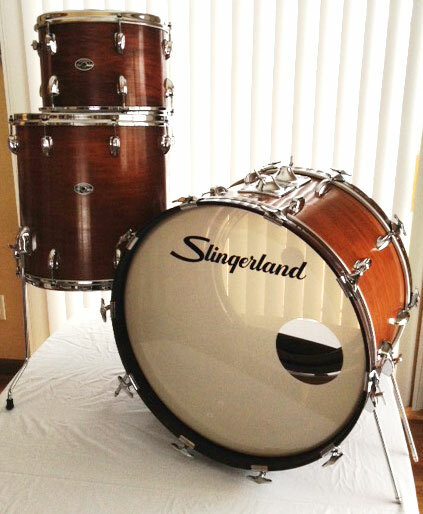 For sale is a vintage Slingerland 1970s Shell Pack. 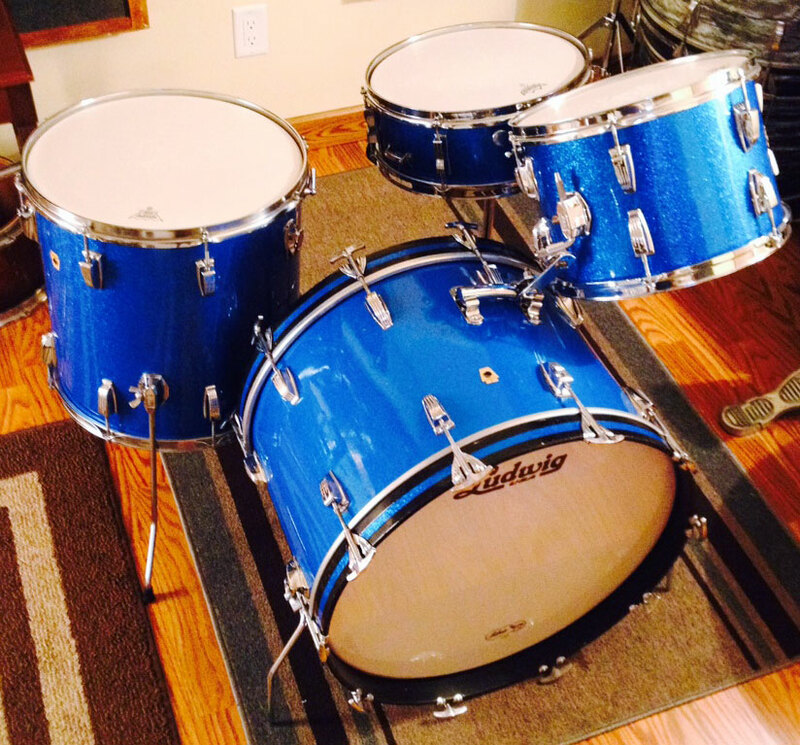 13/16/22 plus an early 1980s Slingerland 14×6.5 chrome over wood 8 lug snare. 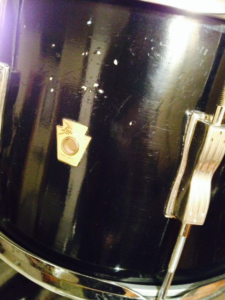 Normal wear, scuffs and dings on shells for a kit of this age. 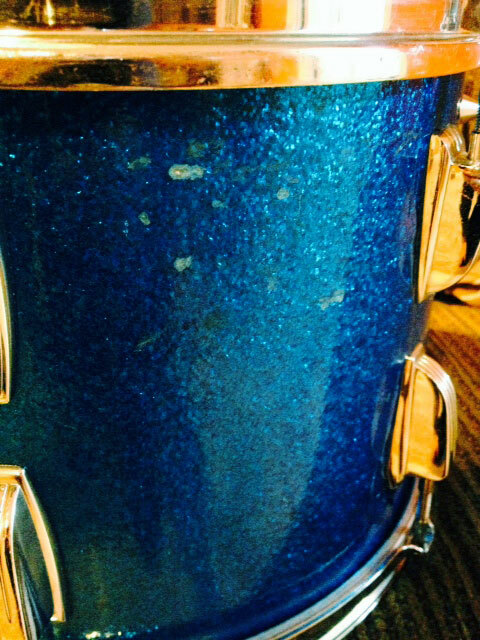 Some normal pitting and wear on chrome hardware. Not a showroom kit, but very clean, an awesome player and loud with great tone. I believe the shells are 3 ply with maple re-rings. The kick has 4 legs and two tom mounts as it is from an Avante set, featuring crazy three rack tom action here. 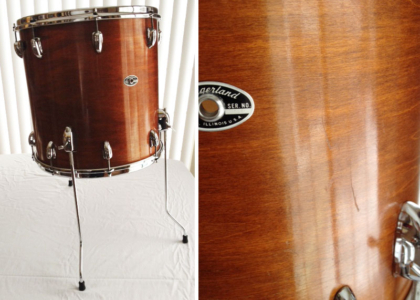 The only non-stock piece on the snare is the throw tension knob as the old one was missing, as well as the snare wires. 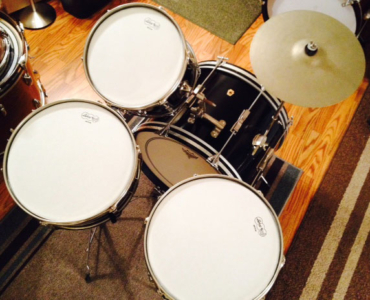 Works, plays, sounds great. 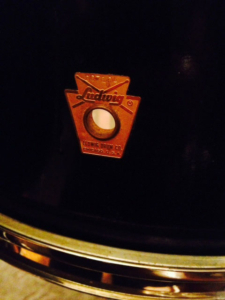 © Copyright 2019 MKE Drum Co. All rights reserved.